Committing, Binding and creating the Policy of the 91st. Rank - While we have all worked hard to earn our Virtual Rank, Ribbons and Awards, we, by no means have any real rank at all. Referring to ourselves as having Rank or displaying our Rank Insignia, Medals or Ribbon Awards in Public would be an insult to Veterans, and Members of the Armed Forces or their families. 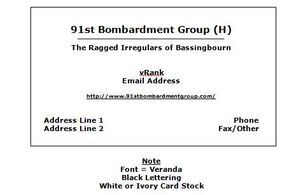 Refer to the rank we have earned in the 91st as "Virtual Rank" when speaking and precede it with a lower case "v" when writing it in any Public Venue or Forum. Authorized Rank terms and Formats can be found below. Never use any "Virtual Rank" that you have not earned here at the 91st. Business Cards - The Business Card shown below is the only authorized Format that may be used. Banners and Letterhead - The 91st Website Header is only authorized Banner or Letterhead. Forum Signatures - The Signatures shown on our Forum Signatures Page are the only authorized versions that may be used. Assumptions - Please do not assume that you can 'Invent and wing it' and sort it out with the Owner after the fact. Stick to these Policies. If you find yourself in a conversation and are faced with something new, just say "let me get back to you on that", then bring the issue to the Site Owner prior to Replying or Committing. (Red Faces are not Comfortable). You probably have a perfectly good and reasonable Idea, but lets talk about it first. Suggestions and Ideas - Suggestions are Welcome, but do this in advance please.